Short answer: with code! Because AdOps only wants to create a limited set of ad slots, and Google DFP slots can be used once per page, you’ll need to display the slot first, and reload it for each subsequent use. The slots are added dynamically as the user scrolls. If a given slot has already been loaded once, then the next time we try to use it we actually pull the first instance over to our new slot, reload it, and add a placeholder for its old position so the page height doesn’t jump. We can use the same trick scrolling back up, simply replacing the placeholder with the refreshed ad. Google’s documentation has a similar example that’s a good reference point for methods, etc. Pay attention to googletag.refresh( unit ); and googletag.pubads().refresh([unitInstance]); — unitInstance is what’s returned by googletag.defineSlot(), so you’ll need to store that somewhere for later reference. I made the mistake of going to a website today. It’s understandable, of course — everybody does it, from time to time — and I’m sure I’ll forgive myself, eventually. I don’t mean just any website, of course, I mean a publication. A place where a business publishes interesting things that I like to read. I couldn’t hit the Reader button in Safari fast enough. In fact, I couldn’t hit it at all, so stunned was I by the flickering colorful circus the page presented. It was like angry fruit salad on meth. Q&A: CMN’s Rusty Lewis and Jon Beck about new advertising options for College Publisher. CMN’s new managed WordPress offering is required to use their advertising software, ultimately meaning they still take a cut of the overall revenue. 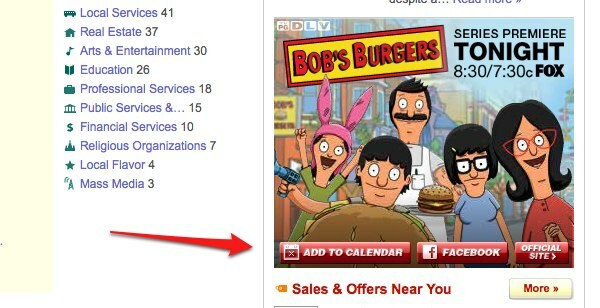 Advertisement spotted on Yelp allows you to add a new appointment to your personal calendar, not a jankity website they’ve set up, for the series premier. Clicking on the button downloads an .ics file. Useful. 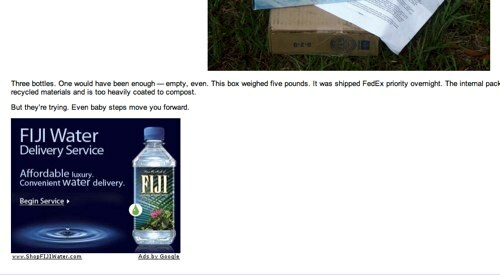 at the bottom of an article about bottled water and greenwash advertising. In my opinion, Lighter Footstep is now sending two contradictory messages: bottled water is killing our environment, and that I should pay a premium to have bottled water shipped from the South Pacific. This juxtaposition is broken because the misleading advertising has the opportunity to negate the value of the journalism. Later: Dave Winer speculates on a “Digg for ads” which falls under this same idea of vetting advertisements (although crowdsourcing this time).